Great place and awesome people! RV Loft is a premium place to keep your RV. 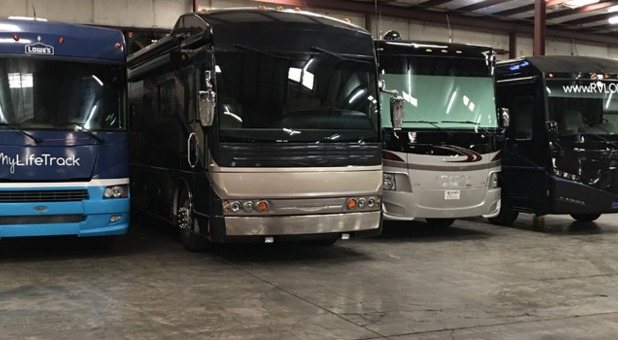 They provide climate controlled indoor storage and exterior wash when returning the RV and a full-service mechanic on site. It is truly a one stop shop. But the most important part is the awesome customer service! We are busy and it is great that these guys can store, service, prep, and keep our units in good condition all in one location. Worth every penny! We flew from Seattle, WA to Marietta to purchase an Rv that Howard was selling for a customer. He went out of his way to make sure everything was taken care of, even filling the gas tank, propane tank, and the water tank to get us a good start on our way back to WA. We would highly recommend Mr Hoover to anyone who needs Rv storage in the Atlanta area, he is a class act in his business practices. . We hope his business continues to grow and look forward to many years in the Rv we bought from him. Thank you Howard! Always so nice and friendly. Love that my RV is safe. We bought our Class C last fall and didn't cherish the idea of storing it "behind the McDonald's" at a open storage lot. How could we be sure that the last guy out remembered to close the gate? How would I get there and back? Didn't even know inside storage existed until we met Howard at the RV show. Not only did he solve our problem, but the way he interacted with our "I'm in charge" teen was great. Also, with all the crazy weather we get around here, its great to know our baby is safe and sound. And I don't have to rely on neighbors to bring me, since they also offer car storage, so I drop off the car, pick up the RV, and am on my way. HIGHLY HIGHLY recommend that you check them out. Thanks for this amazing review! We are so happy to have great customers like you part of The RV Loft Family! The RV Loft makes storage a pleasure. I rent by the month and can easily switch to indoor storage in the winter so I don't have to winterize. That way I get maximum use and can run out between freezes on beautiful days. 24 hour patio access enables me to swap my car for my camper after hours when I get off late from work, and the location is fantastic. They will even turn my fridge on in advance for me! The site is clean, and registration and online bill pay was a breeze. I can't say enough about this place! RV Loft is exceptional and the service is very personal. RV Loft facility is very nice and clean. We are very comfortable leaving our favorite toy (boat) with them during the off season. We stored our motorhome and car here while we were in Europe for 5 weeks. They provided excellent service and drove us back and forth to ATL. The location is easy to reach from I-75 and the peace of mind we had from knowing our home (we full time) was in a safe and secure location was invaluable. We love the concierge service that Casey and Howard have provided. The facility is great!!! Only minutes from I-75, indoor parking, and very secure. The level of concierge service they offer cannot be found any where else in Atlanta. They worked late to detail our coach for an upcoming event and it looked fantastic! They even answered a call at 4:00am when we were having battery problems and helped us get our coach started. All I can say is rent your space soon, before they fill their available spaces.